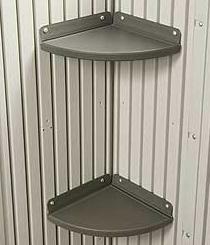 Lifetime 0110 shed accessory allows you to easily add more storage to your shed with these 2 corner shelves. Competitive Edge Products, Inc. is an authorized reseller of Lifetime Storage Shed Accessories from Lifetime Products, Inc. from Clearfield Utah. While many Lifetime shed accessories are interchangeable between models, some are not. In general, any Lifetime storage shed accessory should be usable in any shed model with the same width; i.e. 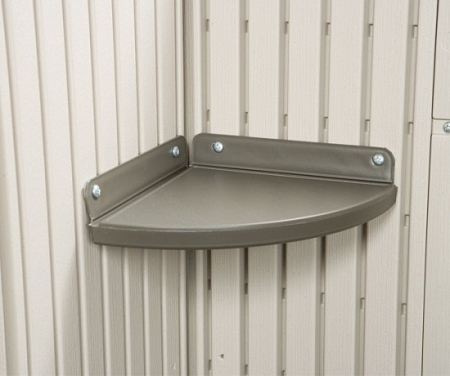 any 8-foot shed accessory when any 8-foot storage shed and any 11-foot shed accessory with any 11-foot wide shed. Please always read through the description carefully before ordering. If the description does not specifically that the accessory can be used on 8-foot and 11-foot sheds, chances are the accessory is not interchangeable. Check out our other Lifetime Shed models and accessories. A+ Seller! Item as stated! Fast shipping! Great communication! Would use again! Fast shipping, great Product, I love it. Exactly as pictured. Good Price, fast shipping, easy to install. We put one in each corner. They look nice and add to the stability of the shed. Exactly what you see. Good shipping too. Good price. Good communication. I would buy again. Q: How much weight can this corner shelf hold? A: The safe weight capacity is 10 pounds. Q: Can this hold the paint can? A: Yes, a typical paint can weighs about 7 or 8 pounds. This shelf can hold 10 pounds. 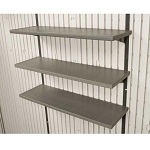 Fast Shipping: Orders for the 0110 Lifetime Corner Shelf For 7 Foot and 8 Foot Sheds generally leave the warehouse the next business day. Dimensions: 13" x 12" x 3"